When the temperatures drop, nostalgia and a hint of homesickness tend to surface when you come from a tropical country. I don’t necessarily not like snow or winter, but the somber skies and that literal cloud over our heads seem to tug on my sentimental self thus the thoughts of sun, sand and sea or that wistful longing for the noisy dirty city sounds and smells. What to do on days like these? 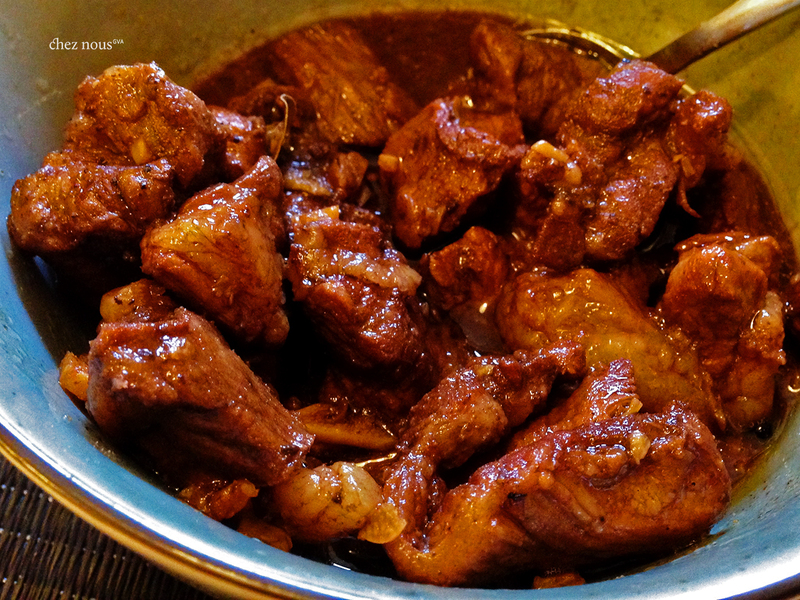 One of the best and easiest comfort food from the Philippines, Adobo can be made with minimal effort. Apart from the meat, all other ingredients are kitchen staples. So I’d pick my meat preference of the day (mainly chicken or pork for this dish) and skip happily on my way home anticipating the scrumptious meal ahead. Almost every province in the Philippines has their own version of this culinary treat, and each of them never fails to delight. 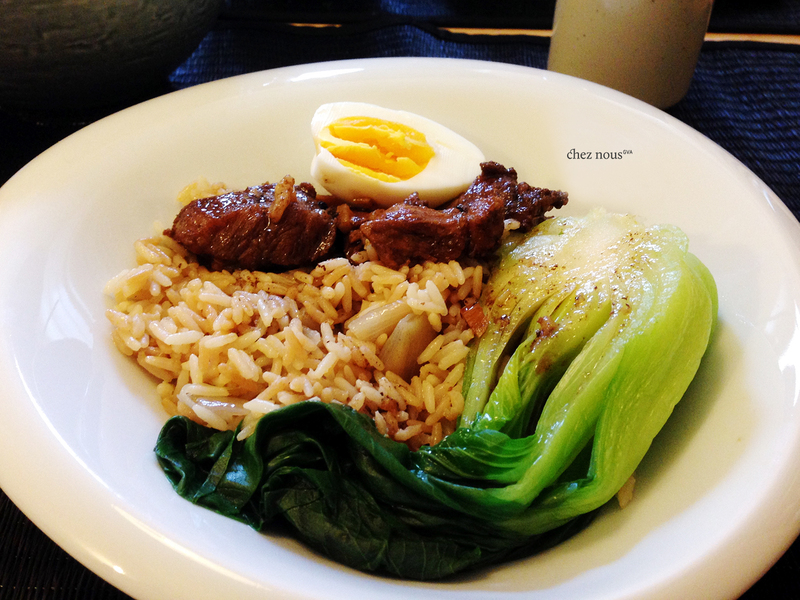 What we recently whipped up is a bastardized Pork Adobo with an egg paired with Riz aux échalotes (rice cooked in shallots and broth) and steamed pak choy. This may well be a perfect representation of my cultural mish mash of the last ten years. Not the most traditional Adobo as I used 2 kinds of vinegar (none of which is the classic white or cane vinegar) and cooked it in duck fat to give a different kick to the dish (and mainly because I had these lying around in the kitchen). Bastardized as it is, this Adobo meal certainly hit the right buttons leaving me and my tummy happy. Simple yet so gratifying. Yum. In a large pan, combine the pork, 2/3 of the crushed garlic, peppercorns, laurel leaves, soy sauce, and both types of vinegar. Let it cook and simmer together until pork is tender. Make sure to keep an eye so it doesn’t dry up and burn. Add a cup of water each time it starts to thicken and let it simmer until the pork is tender enough to your liking. When the it’s cooked enough, pour out the sauce into a bowl leaving the pork cubes and some of the garlic in the pan. Add the rest of the duck fat and garlic. Let the meat and garlic brown, then add back the sauce. Let it boil and thicken, and it’s done! Oh no, it’s hard to tell! 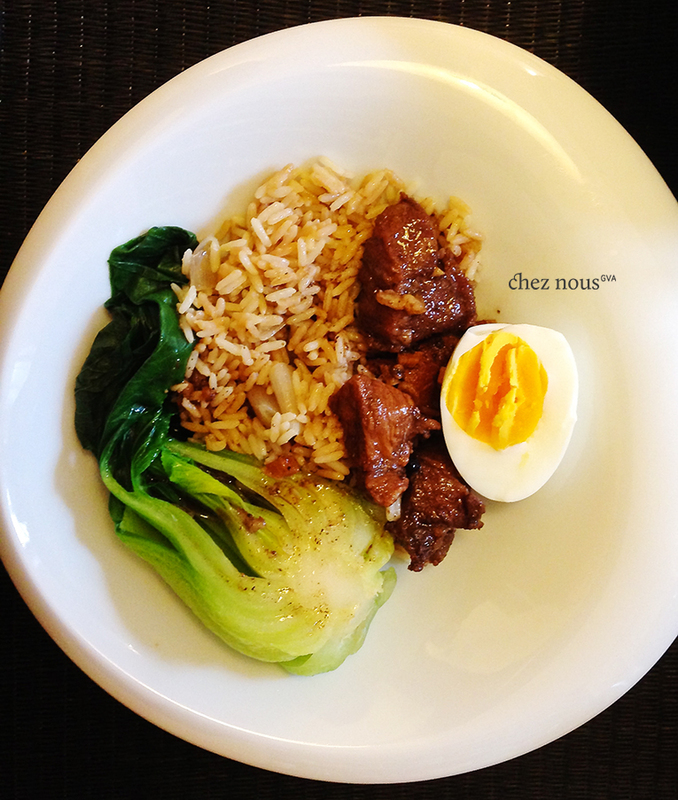 It depends on the cut of the meat – especially with pork. The one that I usually get is the “échine de porc”, and that usually takes 20 minutes only. Some cuts are tougher though (an hour or even more). Better if you time it for 20 minutes and then try to put a fork through. For chicken it’s shorter (I’d say 15-20 minutes). Happy cooking! Hi Sarah, I appreciate your story and recipe. I’m curious if you would be able to participate in a survey I put together to poll Filipinos abroad and how they connect to the homeland via food. I searched adobo and homesick and your blog post popped up. If you have a moment, I would appreciate your participation! Here’s a link: http://goo.gl/forms/LGHNgbkr7h Maraming salamat po! Excellent! Thank you for your time and participation!